China officially became the second biggest economy in the world last month overtaking Japan for the first time, and while the influence of China over most international processes has been clear for a long time, can we ever expect to influence the Chinese government? Both Oxfam and Greenpeace must believe so, as they’ve expanded out of Hong Kong to open offices in Beijing and include advocacy as one of the priority activities that they’re involved. However putting the words ‘China+advocacy’ or ‘Influencing Chinese government’ doesn’t come up with many useful results. No doubt that’s partly down to the lack of documents in English and the unique political system in the country. But even so the material about doing so seems to be very scarce, so I hope that this post will be an opportunity to learn from others about how organisation have gone about starting to think about the opportunities. Here are two example of advocacy in or towards China that I’m aware about. What others can you add? And what, if anything can we learn from them? Greenpeace East Asia – Last year, Greenpeace alongside ad-agency Ogilvy turned 80,000 pairs of used chopsticks into trees which were displayed in Beijing in an attempt to highlight the impact of using disposable chopsticks was having on the countries forests, and encouraged people to sign a pledge to carry around their own pair of chopsticks. However, the focus of this campaign was on raising public awareness and personal action rather than political action. Avaaz – In 2007/08 the online campaign movement repeatedly asked its supporters to send messages to the Chinese government over the situation in Burma. It collected an impressive 800,000 names on its petition which called for an end of the oppressive crackdown on demonstrators, including placing an advert in the Financial Times asking ‘What Will China Stand For?‘. For me, these two examples raise as many questions as they answer. Do our traditional models of ‘northern’ advocacy need to change if we want to be effective in China? Is ‘quiet’ advocacy more likely to work than public mobilisation? What’s the role of the international media? 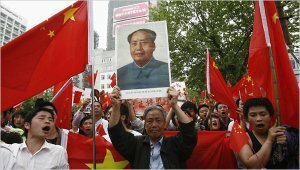 Does China worry about the way its perceived by others around the world?